Our Secure Barcode Sticker or Fast Pass Tag on your windshield confirms your membership. A quick scan and you are on your way! Monthly credit card Auto Pay. Cancel any time after the 2nd month. (7 day cancellation notice required) $9.99 offer is for new members only & will be credited to your account on first visit. Get ScrubaDub clean, anytime you want. Want a clean and shiny car all the time? 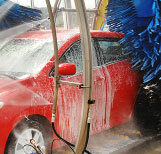 Unlimited Car Wash Club Members can wash their vehicle once a day, once a week, or as often as they like. 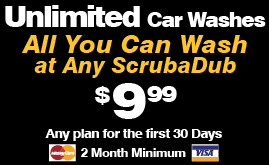 Join our ScrubaDub Unlimited Club now. Sign up online, bring your confirmation to your closest ScrubaDub and start washing right away! Need to update your credit card information? Change or cancel your wash plan? Make changes to your account online. Commercial vehicles such as taxi’s and transportation companies are prohibited from our consumer unlimited plans. Plans for our commercial customers start at $39.99 and require a 6 month minimum. Please visit any ScrubaDub location to join or for more details.